We have been operating a wedding and engagement photography business in the Washington, DC, metro area for several years now, and in the time that we have spent taking pictures of happy couples tying the knot in and around the Nation’s Capital, we have seen certain trends emerge with regards to the venues that future spouses choose for their nuptials. Every year, certain sites become the hot choice for wedding celebrations — the place that every bride- and groom-to-be want for their marriage event. Sometimes the “in” locales are luxury hotels in downtown Washington, DC; sometimes they are beautiful vineyards amid the rustic charm of Northern Virginia’s wine country. Whereas the trendy venues tend to change on a nearly annual basis, there are other sites for wedding ceremonies and receptions that remain consistently popular choices year after year amongst Washington, DC-based fiancés. One example of the latter is the University of Maryland, College Park. Located less than five miles from the DC-Maryland border, this institution of higher learning is the largest in the state of Maryland. UMD is also the biggest in the Washington, DC metropolitan area, meaning it has a network of alumni scattered throughout the Nation’s Capital. It should come as little surprise, therefore, that it is also a popular Washington, DC destination for marriage celebrations. Many University of Maryland graduates like to come back to their alma mater to exchange their vows at the place where, in many cases, their love stories began. The lovely bride and groom in image featured here were two of those alumni. They met while undergraduate students at the University of Maryland, fell in love and decided to come back to their old school to get married. These future spouses chose to have their wedding ceremony in UMD Memorial Chapel. That particular church is a very popular venue for graduates of Washington, DC’s biggest public university, because it is non-denominational and open to all, in addition to having seating for up to 1000 people. After they finished exchanging their vows in a wedding ceremony that was both touching and humorous (the bride got so nervous that she forgot her future husband’s name at one point! ), the newly married couple left UMD Memorial Chapel and went outside for their couples portraits. Because the UMD campus had played a role in the early days of their love story, they decided to turn the formal portraiture portion of their wedding day into a photo tour of the university. For starters, they took us all around McKeldin Mall, a massive, nine-acre quad that sits at the heart of the college grounds. The largest university mall in the country, the green space is a beautiful spot in which UMD undergraduates can sit outside on a sunny day and a perfect venue in which to take pictures of newlyweds enjoying their first hours of married life. 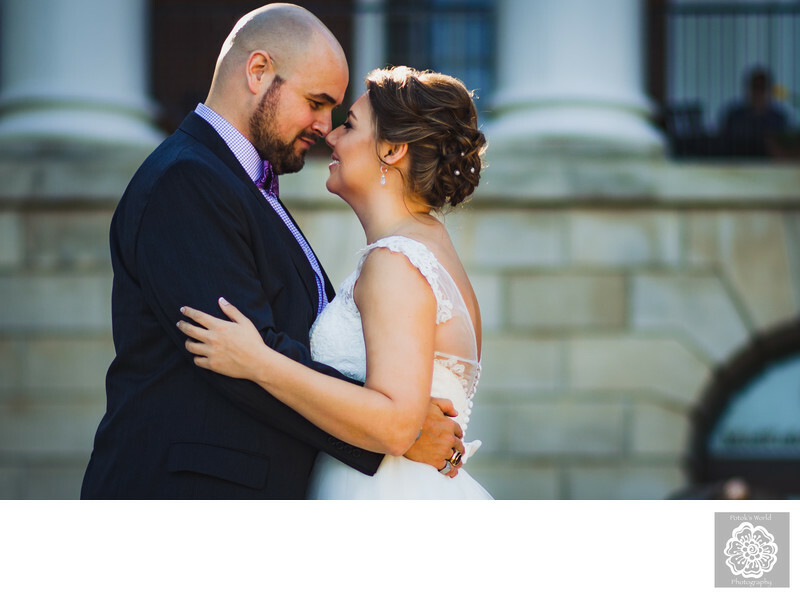 One of the best spots on the mall to capture images of a new husband and wife is the steps of McKeldin Library, which sits at the west end of the quad and which is where we took this magical photo. With its stunning red-brick Georgian architecture perfectly complemented by stately white columns, the building makes a gorgeous backdrop for pictures of a couple in love. It is also a great place to get iconic photographs of newlyweds posing with Testudo, a statue of the University of Maryland’s terrapin mascot, which we did shortly after taking this particular image. Location: University of Maryland, College Park, College Park, MD 20742.